A tragic fatal accident at the Kupol mine in Russia is a stark reminder of the utmost importance of keeping safety as a first priority. This was the first employee fatality at a Company mine site since 2012. The Report describes measures that have been implemented to improve safety, including a critical risks and controls program and improved reporting of high potential incidents. Total Reportable Injury Frequency Rate (TRIFR) of 0.32, the lowest in Kinross’ history. $2.8 billion spent in host countries through wages and procurement of goods and services, including $800 million spent in local areas around our sites on wages, goods and services, and local taxes. 79% of goods and services sourced in-country, working with more than 3,500 suppliers. 112,000 stakeholder interactions at operating sites. Reached more than 850,000 beneficiaries through community programs. 82% of water from operations recycled. Among the lowest carbon footprint in comparison with our peers. Further strengthened tailings dam management and monitoring program. 97.7% of Kinross workforce hired in host countries. 33% of board of directors are women. Promoted employee development through core values, new 8 People Commitments, leadership development model, and the new online Kinross University. Zero cases of corruption or allegations of human rights violations. Continued to improve processes and policies, including updating the Code of Business Conduct and Ethics and publishing a new Working with Integrity guidebook for employees. The Report follows the Global Reporting Initiative (GRI) framework, fulfills Kinross’ commitments as a participant in the United Nations Global Compact by publishing a “Communication on Progress” report, and includes coverage of how Kinross has linked business performance to the UN’s Sustainable Development Goals. The Report also documents key stakeholder issues and Kinross’ responses on a site-by-site basis, and provides results from a recent socio-economic study examining how mining contributes to sustainable development in the rural areas around our Tasiast mine in Mauritania. The study demonstrates the significant reductions in poverty in the region around the Tasiast mine between 2011 and 2017. Kinross has also continued to evolve and improve how it approaches its Corporate Responsibility strategy. 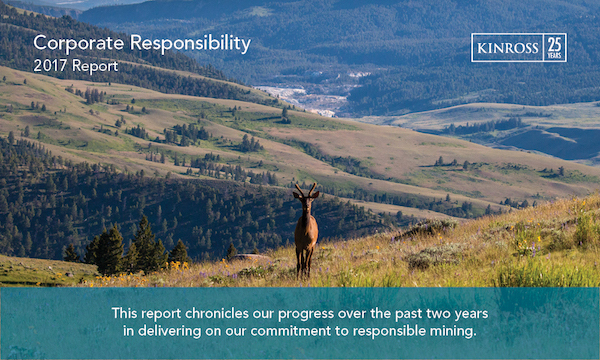 The Company updated its Guiding Principles for Corporate Responsibility after a cross-discipline review to ensure there is operational accountability through relevant metrics that track performance against each Principle. You can find Kinross’ Guiding Principles for Corporate Responsibility here.